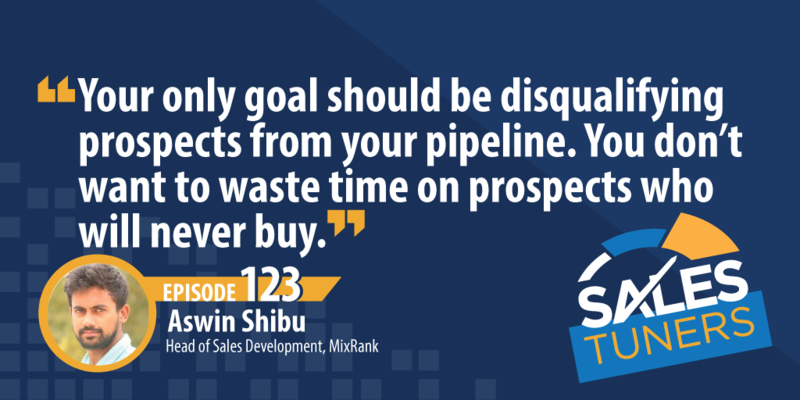 Aswin Shibu (@Ashwin_7) is the Head of Business Development at MixRank, an app intelligence company that tracks and sells data from 10 million apps to help sales teams automate lead prospecting and find new customers. After graduating as an engineer, Aswin never imagined a career in sales. But after launching his first startup, he got bit by the “startup bug” and re-focused his energy from engineering to sales. With this defining career shift, a star was born—it turns out, he’s a natural salesman. In fact, when starting out at MixRank, Aswin generated a $100k pipeline in his first 30 days. No small feat—especially since English is his second language. Listen in to hear him lay out the specific strategy he used to do it. Invest Time Building the Right List: Knowing who your ideal prospect is, is only the beginning of a good outreach plan. Don’t take for granted the amount of work that goes into identifying exactly who those people are and trying to acquire their contact information. If you’re doing this manually, it’s a lot of work, and even if you’re paying for data sources, it still takes a lot of preparation to do it right. After you identify the right people, next spend some time trying to hypothesize what problems each of these companies uniquely face and what messaging you can use to address them on an individual level. Build Discipline Into Your Calendar: As a sales professional, it’s almost a given we have some level of ADD and the unique ability to find every squirrel there is in our day to day. That said, when you’re to take your game to the next level, blocking time on your calendar for all important activities is the first step to ensuring that success. Sure, you may believe you can multitask, or you may believe you have superhuman powers to just be able to will everything into getting done, but you could also just schedule the activities and make commitments to yourself. I use this technique to even schedule in time to learn about new things. Giving myself that permission ensures I don’t feel guilty about not doing something else high on my priority list. Learn to Reset Everyday: Look, I’m a gambler and always find it humorous when I go to Vegas and see previous outcomes of the roulette wheel displayed. Why? Because they literally have nothing to do with the independent event of the next spin, yet some people let them guide their bets. Whether you just closed a one million dollar deal or heard “no” 47 times, yesterday is in the past and should have no bearing on what you do today. In sales we have really high highs and just as low of lows, you have to force yourself to manage that energy and see each day just like the roulette wheel—an independent event.